To Cite: Lu J, Li J, Li Q, Li Z. Meta-Analysis to Assess Efficacy and Safety of High-Dose Ibuprofen Compared with Standard Treatment of Patent Ductus Arteriosus in Premature Infants, Iran J Pediatr. 2017 ; 27(4):e6328. doi: 10.5812/ijp.6328. Background: Patent ductus arteriosus (PDA) is a common congenital heart defect in premature infants. Intravenous injection of ibuprofen is used for PDA treatment, but its optimum dose, efficacy, and safety are unclear. Objectives: This meta-analysis aimed to access randomized controlled trials that compared high- or low-dose ibuprofen with a standard dose of ibuprofen for closure of PDA in preterm infants. Methods: The standard search methods of the Cochrane neonatal review group were used to screen ibuprofen versus indomethacin trials. All groups that used ibuprofen in those trials were filtered out. The high-dose group was defined as those using an average dose of ibuprofen greater than or equal to 10 mg/kg in the first three days. Results: We identified 14 studies of good methodological quality comparing ibuprofen to indomethacin trials among neonates. Results showed that high-dose ibuprofen could remarkably raise the closure rate (relative risk = 0.90, 95% CI = [0.81, 1.00], P = 0.04). No significant differences were found in adverse effects, bleeding disorders, or oliguria. The closure rate in neonates with PDA increased with the ibuprofen dosage (R2 = 0.9990). The loading dose produced a significant closure rate compared with the low-dose group (relative risk = 1.91, 95% CI = [1.25, 2.92], P = 0.003), with no increase in toxic side effects. Conclusions: Loading dose is a necessary strategy for infants with PDA. A high dose of ibuprofen for PDA closure was more effective than a normal dose of ibuprofen. The side effects in both treatment groups were not significantly different. Given the small sample size and risk of bias in all trials, the tolerability and safety of the dose regimen should be assessed in a large population before considering the use of these doses for PDA. The ductus arteriosus is a normal fetal blood vessel that closes soon after full-term birth. Patent ductus arteriosus (PDA) is a congenital disorder in neonates in which the vessel fails to close after birth and remains patent or open (1, 2). In PDA, additional fluid from the ductus returning to the lungs increases lung pressure to the point that the neonate has great difficulty inflating the lungs (3-7). PDA is accompanied by the irregular transmission of blood, the increased work of breathing, and poor weight gain, which may lead to congestive heart failure or death (8). PDA is the second most frequent (41.7%) disease in preterm infants, behind respiratory distress syndrome (93.6%) and ahead of bronchopulmonary dysplasia (38.7%) (9). PDA can be treated by both surgical and nonsurgical methods. Most immature infants are likely to require pharmaceutical treatment to close the ductus, thereby avoiding the need for PDA ligation (10, 11). Pharmaceutical treatment enables doctors to cope with more patients and save operation costs for infants (12, 13). Prostaglandin E1 is responsible for keeping the ductus patent, whereas indomethacin and ibuprofen are potent inhibitors of prostaglandin E1 synthesis. As a result, both drugs are usually prescribed for the treatment or prevention of PDA. Ibuprofen was recently reported to be as efficacious as indomethacin for the treatment of PDA, with less oliguria (14, 15). Therefore, ibuprofen is a potential viable alternative for premature infants. However, research on neonates treated with ibuprofen is lacking (14-16). Most small sample studies, although useful, generally involve much higher doses that are difficult to extrapolate to all populations of preterm infants over prolonged periods. The present meta-analysis examined the basis for ibuprofen dosage in the neonatal population. 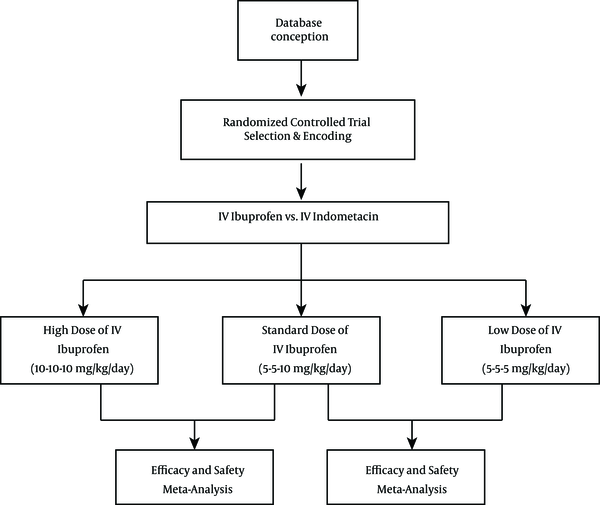 This paper includes a commentary on the publication of a randomized controlled trial of intravenous (IV) ibuprofen versus IV indomethacin. The outcome between groups of different ibuprofen dosages is also analyzed. The aim of this meta-analysis was to assess the efficacy and safety of high-dose ibuprofen compared with the standard treatment of PDA in premature infants by evaluating randomized controlled trials that compared high- or low-dose ibuprofen with a standard dose of ibuprofen for the closure of PDA. The criteria and standard methods of the Cochrane neonatal review group were used to assess all clinical studies. We searched the Cochrane library, Medline, EMBASE, clinicaltrials.gov, Controlled-trials.com, www.abstracts2view.com/pas, and personal files in December 2013. Medline (1966 to December 2013) was searched using the following MeSH terms: ibuprofen, newborn, infant, premature (or preterm) or low birth weight infant, and patent ductus arteriosus or PDA. Other databases searched included EMBASE (1980 to December 2013) and Medline (1966 to December 2013), which was searched using the following MeSH terms: ibuprofen (or mefenamic acid), newborn, infant, premature (or preterm) or low birth weight infant, and patent ductus arteriosus or PDA. This study involved preterm infants (gestational age < 37 weeks) or low birth weight infants (< 2500 g) with PDA diagnosed either clinically or by echocardiography during the neonatal period (< 14 days). This meta-analysis reviewed randomized controlled trials of ibuprofen for the treatment of PDA in newborn infants. The therapeutic use of IV ibuprofen for the closure of PDA was compared with that of IV indomethacin in control infants. Oral ibuprofen was excluded in all studies. For this update in 2013, we included studies that compared the effectiveness of ibuprofen with indomethacin, studies that compared low-dose ibuprofen with a standard dose of ibuprofen, and studies that compared high-dose ibuprofen with a standard dose of ibuprofen for PDA closure. We identified controlled studies that were assessed by the following criteria: ascertainment and validation of study outcomes, selection and comparability of controls, ascertainment of exposure, and control or adjustment for potential confounders. To determine the possibility of publication bias, a funnel plot was conducted for the primary outcome of failure to close a PDA (after three doses). The funnel plot was quite symmetrical, indicating no obvious indication of publication bias. Each review author extracted data separately using data abstraction forms. The review authors compared results and resolved differences. One review author (Jinmiao Lu) entered data into RevMan 5.1. The other review authors (Qin Li and Zhiping Li) cross-checked the printout against his data abstraction forms, and errors were corrected by consensus. For the studies identified as abstracts, we contacted some primary authors to ascertain whether a full publication was available if the full paper was not identified in an electronic database. We obtained information from the primary author if the published article provided inadequate information for the review. Retrieved articles were assessed, and data were abstracted. Disagreements were resolved by group discussion. The data were analyzed using RevMan 5.1 software. Analysis was performed using relative risk, risk difference, and numbers needed to treat or harm for categorical variables and weighted mean difference for continuous variables. A 95% confidence interval (CI) was reported for each statistic. A fixed-effect model was used to pool data for this meta-analysis. If statistically significant results were obtained, a random-effect model was applied to assess whether the results were robust to changes in the statistical model. Heterogeneity was estimated by the I-squared (I2) statistic. The search was run until December 2013. We first identified 163 abstracts using the prespecified search strategy, and 14 reports were retrieved for detailed evaluation (Figure 1). Table 1 summarizes the characteristics of studies included in the meta-analysis. Three small randomized trials involving 24 neonates were eligible for inclusion in the high-dose group (10 mg/kg/day). Only one study tested IV ibuprofen versus IV indomethacin at a very low dosage (5 mg/kg/day) for PDA closure. Table 1 lists all included studies, such as those conducted by Mosca et al. (17), Cheng et al. (18), Patel et al. (19), Chotigeat et al. (20), Adamska et al. (21), Gimeno Navarro et al. (22), Hammerman et al. (23), Lago et al. (24), Patel et al. (25), Su et al. (26), Van Overmeire et al. (15) and Pezzatiet al. (27). Upon combining the data of these studies regarding high-dose ibuprofen, the results (Figure 2) suggested that a high dosage of ibuprofen administered prophylactically to all preterm infants (< 35 weeks gestation) for the first three days of life reduced the risk of developing a PDA (relative risk = 0.90, 95% CI = [0.81, 1.00], P = 0.04). Moreover, a decreased PDA closure rate (Figure 3) for ibuprofen to treat PDA in premature infants was noted without a loading dose (relative risk = 1.73, 95% CI = [1.09, 2.75], P = 0.02). Ibuprofen can lead to blood loss in some people, which can result in dangerous side effects if left untreated. Complications of PDA include intraventricular hemorrhage, which can lead to severe brain damage. Significant evidence showing that a high dosage of ibuprofen prophylactically improves bleeding disorder events for premature infants is lacking (relative risk = 0.89, 95% CI = [0.43, 1.86], P = 0.76). There is also no significant evidence to suggest that a low dosage of prophylactic ibuprofen decreases oliguria rates (relative risk = 1.24, 95% CI = [0.61, 2.53], P = 0.55). 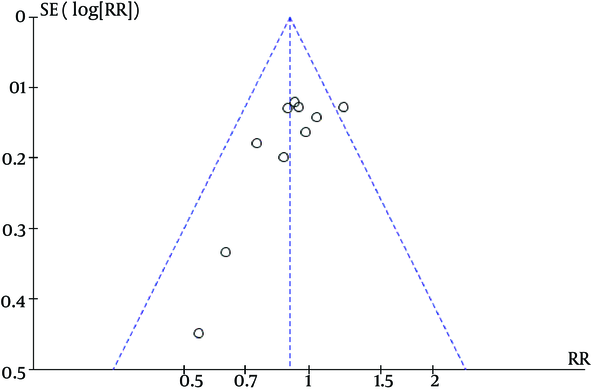 The funnel plot was quite symmetrical, showing no obvious indication of publication bias (Figure 6). Finally, no significant heterogeneity was found in any of the studies. PDA has a high occurrence of nearly 15.3% in premature infants (28). Persistent patency of the ductus arteriosus in preterm infants is associated with numerous morbidities including higher rates of bronchopulmonary dysplasia and increased mortality (16, 29, 30). Cyclooxygenase inhibitor interventions have adverse effects such as bleeding disorders and oliguria (31, 32). Dani et al. (33) highlighted the possible advantages of high-dose ibuprofen, concluding that the high-dose ibuprofen regimen is more effective than the standard-dose regimen in closing PDA in preterm infants without increasing adverse effects. None of the previous individual randomized controlled trials or the meta-analyses have been able either to demonstrate the dosage benefits of ibuprofen in inducing ductal closure or to demonstrate all side effects (34). They concluded that a meta-analysis is difficult to conduct in neonates, because comparable datasets cannot be extracted from all the small-sample or low-quality studies. Our new analytical approach restricted analyses to studies that had collected data relevant to the comparisons of IV ibuprofen and indomethacin. Pooling of these studies yielded positive dose-response relations for ibuprofen. The prevalence of spontaneous ductal closure in premature neonates was 34% at one week postnatal (35). We found that the low relative risk with ibuprofen was due to the low dosage of ibuprofen with respect to either efficacy or adverse events. Our linear analysis (Figure 7A) suggested that ibuprofen, as used in clinical practice for PDA in most countries, was associated with an increased closure rate of PDA in a dose-dependent manner as well as with data points prior to log transformation and curve fitting (log-agonist vs. response-variable slope, R2 = 0.99909). Our curve suggested that the population of nonresponse to ibuprofen therapy was distributed across all patients with PDA. 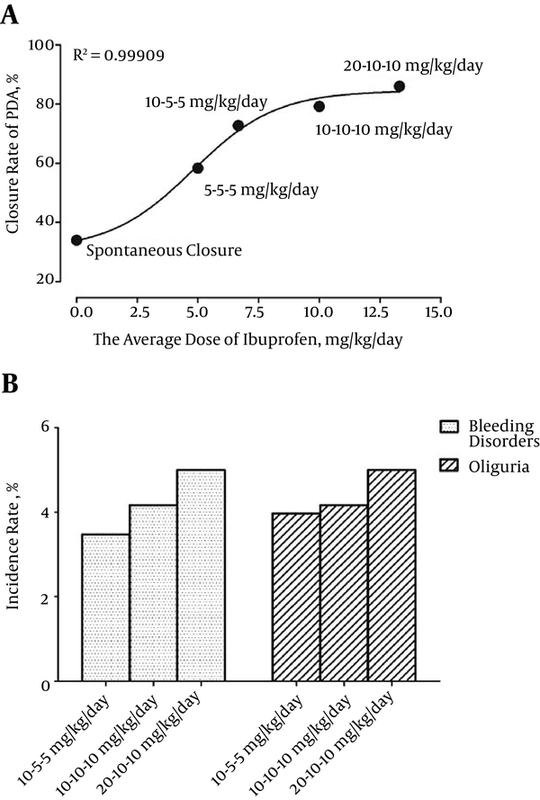 We also found that the ibuprofen dosage was positively correlated with the incidence of bleeding disorders and oliguria (Figure 7B). The differences were attributable to the fairly high dose of ibuprofen employed in clinical practice. A second course of ibuprofen may further improve the efficacy of the drug with great side effects. The evidence reviewed indicated that these doses were associated with clinical benefits. However, the risks recorded in these studies were also associated with the doses of ibuprofen. Our findings were in line with the results of a double-blind dose-finding clinical trial of newborns in France (36). In conclusion, despite the potential shortcomings of the aforementioned trials, they provided substantial cumulative evidence that a high dose of ibuprofen could remarkably raise the closure rate in preterm infants. In addition, loading dose was necessary for PDA closure. However, the tolerability and safety of this dose regimen should be assessed in a large population before considering the use of these doses for ductus arteriosus closure. Large-scale trials are needed to examine the side effects and long-term sequelae. We thank the authors of the included studies for clarification of the existing data. The original work reported in this paper was supported by a general program grant from the national natural science foundation of China (No. 81370776). No other conflicts of interest are reported. Authors’ Contribution: Study concept and design: Jinmiao Lu; acquisition of data: Qin LI and Jing LI; analysis and interpretation of data: Jinmiao Lu and Zhiping Li; drafting of the manuscript: Jinmiao Lu; critical revision of the manuscript for important intellectual content: Jing Li, Qin Li and Zhiping Li; statistical analysis: Jinmiao Lu. Funding/Support: General program grant from the national natural science foundation of China (No. 81370776).